For February we are keeping it all in the family. Resident DJs Sappho, StormyRoxx, and The Prey will be playing NoFOMO's signature blend of cosmic disco, house, and techno. Our host Snake Oil is a performance artist and designer based in Portland OR. They are the founder of the art collective Drama Club. Snake Oil is known for their award-winning presentations in ballroom and drag competitions and is the reigning Filthiest Person in Portland. NoFOMO is an inclusive monthly event produced by a queer collective dedicated to Portland's homegrown cosmic dance music sounds. 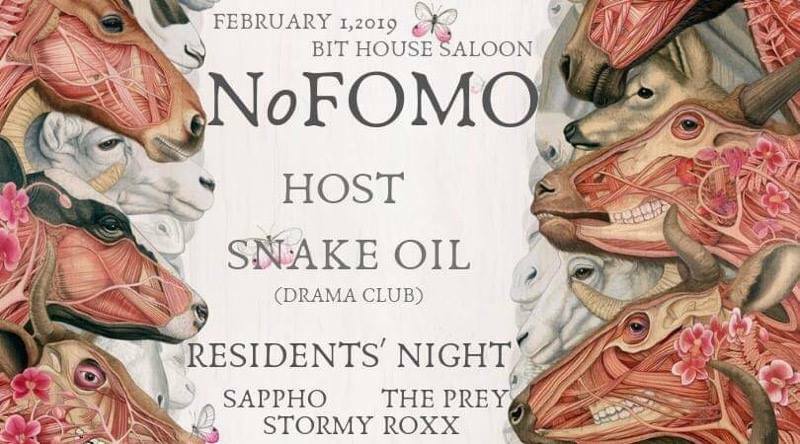 Resident DJs Sappho, Stormy Roxx, and the Prey plus special guests, first Fridays upstairs at Bit House Saloon.